Arlington has one of the highest median rent prices in the entire country, yet the county still ranks among the top places people can afford to live alone. That’s according to a new study of 100 of the nation’s largest cities and counties by the financial data research firm SmartAsset. 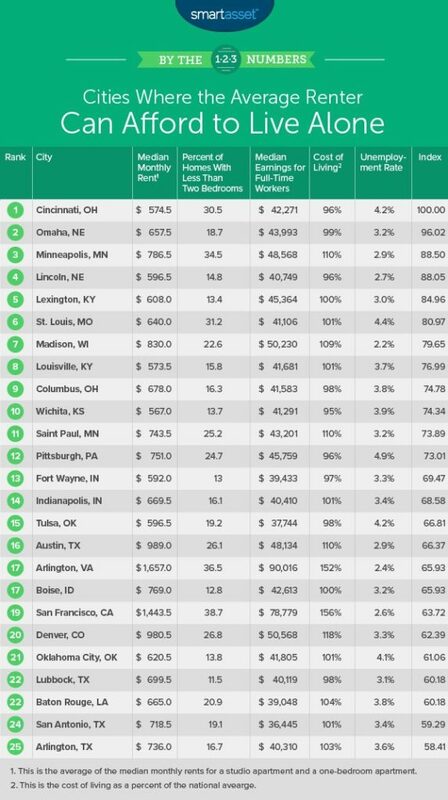 The company ranked Arlington 17th among that group for places where renters have the financial wherewithal live alone, largely because of the robust median income level of the county’s workers. SmartAsset found that full-time employees in Arlington have a median income of just over $90,000 a year, putting the county at the top of the list among the firm’s top 25 places where renters can afford to go solo. 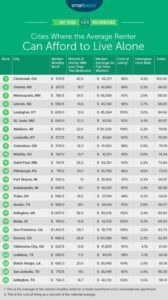 The county’s median monthly rent of $1,657 was also the most expensive of any other city on the company’s top 25 list, yet Arlington still ranked ahead of other large cities for renters looking to live alone, including San Francisco and Denver. For context, the median income in D.C. is just over $75,500 a year. SmartAsset didn’t immediately have median rent prices available for the District, but real estate listing firm Zillow found that the median rent in the city was about $2,146 a month last year. Arlington also scored high marks in SmartAsset’s rankings for its stock of homes with less than two bedrooms. In all, the company found that 36.5 percent of homes for rent in the county have one bedroom or are studio apartments. Cincinnati, Omaha and Minneapolis ranked as the firm’s top three cities where renters can live alone. The full rankings are available on the company’s website.